May 13, 1961 – The Most Reverend Francis J. Green, D.D., Bishop of the Diocese of Tucson, of which we were a part at that time, issued the Decree of Erection establishing St. Daniel’s Parish. The boundaries of the church were from the south side of Thomas Road to the river bottom, and from the east side of 64th street to the west side of Pima Road. The parish was named for St. Daniel the Prophet who wrote the Book of the Old Testament which bears his name, and also in honor of Bishop Daniel J. Gercke, retired Bishop of the Diocese of Tucson, who was celebrating his 60th anniversary of ordination to the priesthood. Rev. Paul G. Lawrence, pastor of St. Matthew’s Parish in Phoenix was appointed pastor of the new parish. August 14, 1961 – First meeting of men of the newly established Parish was held at St. Theresa’s Parish Hall. Sixty -two men in attendance. August 20, 1961 – The first Masses were scheduled for 7:00 and 9:30 am in the cafeteria of the Motorola plant located east of Hayden Road. There was a total of 647 parishioners in attendance, 207 received Holy Communion. Sunday masses continued at Motorola until October 28, 1962. October 1962 – Confessions were heard in the construction shack of Mereway Manor on Latham Street. October 28, 1962 – This was the day of the Feast of Christ the King. It was our big day with the first Masses in our own church. January 1963 – This was the date of the beginning of our own elementary CCD classes and the following month was the start of CCD classes for High School students. August 1963 – Sisters John Leo, Paul Augusta and Marie Louisa of the Dominican order arrived. September 1963 – St. Daniel’s Parochial School opened with Kindergarten, first, second and third grades. Sr. Paul Augusta served as the first Principal. December 13, 1963 – Father Lawrence, the founding pastor, died. December 1963 – Father Clemens M. Schleuter appointed Administrator pending the appointment of a permanent pastor. September 1964 – Reverend Martin C. Kelly appointed pastor. Father Kelly was transferred from St. Rose of Lima parish in Safford. Through 1964 the house on Roosevelt St. was used as the rectory. 1965 – Enlargement of the church (our present social hall). The seating capacity was increased from 500 to 800 plus by extending the building to the north as it presently exists. The home on Latham Street was purchased for the Rectory. The Roosevelt house became a temporary convent for our first sisters. 1966 – In January, the two-story school building was completed. This provided the Parish with a Social Hall on the first floor and two classrooms on the second floor. During this period the Parish continued to grow in membership and scope. We saw the start of our St. Vincent de Paul Society and the Legion of Mary Chapters. June 1969 – Fr. Eric Tampe came to us as an Associate. He took a deep interest in the Vista del Camino Community within our parish and found Spanish speaking priests who came in to offer the parish’s first Spanish Masses for the Yaqui and Hispanic parish members. 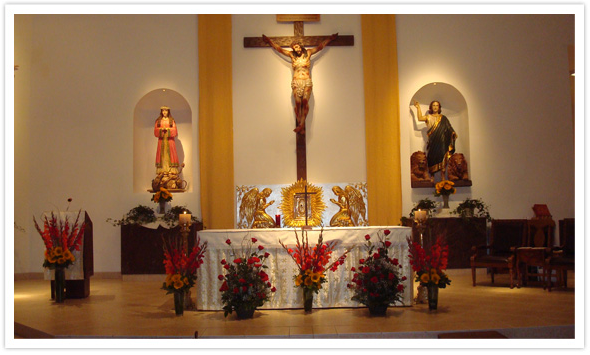 Our Hispanic Community has grown through the years, with a regular schedule of Masses and activities. June 1969 – A permanent convent was completed on Latham Street on two lots purchased with the rectory five years earlier. July 1, 1975 – Father Louis Sigman appointed Pastor. Fr. Sigman came to us from St. Theresa’s Parish in Phoenix. In the following years, planning began for a new Church Building. October 3, 1979 – Groundbreaking for the Church took place. Construction was begun with the completion of the church and consecration by Bishop James S. Rausch in 1981. June 1985 – Our former Associate Pastor, Fr. Michael O’Grady returned to St. Daniel’s as Pastor. 1988 – St. Daniel’s welcomed the arrival of Sisters Mary Lucilla Wertz, S.C. and Alice Ruane, S.C.
July 1, 1990 – Fr. Robert Caruso appointed Pastor and served for a period of two years. July 1, 1992 – Fr. Francis R. Zappitelli appointed Pastor. September 1, 1992 – Fr. Dennis O’Rourke appointed Associate Pastor. July 1, 2001 – Fr. Joseph McGaffin appointed Pastor. December 2003 – Fr. John Coleman appointed Administrator. July 1, 2004 – Fr. T. McGuire appointed Pastor. February 2005 – Fr. Joaquin Cui appointed Associate Pastor. Summer 2007 – Daughters of Mary Sisters are welcomed to the parish. July 2007 – Fr. Pedro Velez appointed Associate Pastor. July 2010 – Fr. John Parks appointed Associate Pastor. June 2012 – Fr. Joseph Knoll appointed Associate Pastor. Sr. Leonor Chacon and Sr. Guadalupe Pascua assigned to St. Daniel the Prophet.